This week saw the techUK host a workshop on securing the Internet of Things and overcoming the risks associated with an increasingly connected world. The event (#IoTSecurity) attracted a variety of speakers from the public and private sector and brought about some interesting topics and further questions on this ever changing landscape. Stephen Pattison from ARM, introduced the event, and brought up and interesting view of the challenge with keeping IoT devices up to date – either with firmware, software or hardware improvements. He observed there is often a disparity between the small inexpensive sensor, actuator, or controller type components and the host device with respect to life span. For example, a car may last 15 years, whilst a tracking component may last 36 months. The rip and replace nature of general consumerism has subtle issues with respect to the IoT landscape, where the re-provisioning of new embedded devices, or the improvement in existing devices is often overlooked. 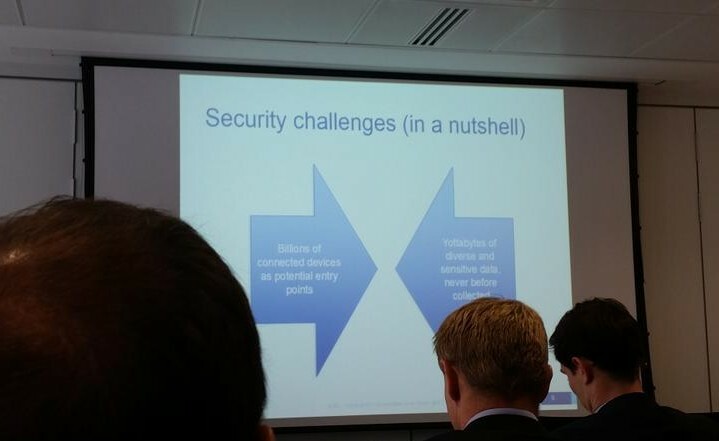 Duncan Brown, European Security Research Director at IDC, outlined some of the key problems facing the IoT landscape from a security perspective. The main factors contributing to the security issue, can basically be broken down into the number of physical devices and the amount of data those devices generate. The sheer volume of connected devices, opens up a new attack vector, with often the network these devices operate on, only being as secure as the weakest link. That weakest link is often a low powered and poorly protected device, which allows a land and expand pivot style attack, which if successful, can quickly allow attacks on to more powerful computing resources. The second main factor is associated with the yottabytes (a trillion terabytes !) of data IoT devices related devices are capable of collecting. That data needs to be protected in transit and also at rest, where transparent access control and sharing protocols need to be applied. These issues of course, are now opening up new sub-industries, where security assessments, device certifications, software audits and consultancy practices can provide services for. As with many consumer related interactions, IoT also create an ‘elastic security compromise’. You seemingly can only have 2, out of enjoyable user experience, low risk and low cost. David Rogers, CEO of Copper Horse Solutions, with his specialism in mobile security, focused on describing how some of the challenges facing the telco operators over the last 10 years, can now be applied to the IoT space. With many newly manufactured cars by 2017 going to contain SIM technology, attack vector, data collecting and data sharing aspects of driving will increase substantially. David made a subtle observation with respect to how IoT attacks could develop. Whilst many laugh at the prospect of their digital fridge or washing machine being hacked as a gimmick, the net result of a large scale attack on home automation, isn’t necessarily placing the immediate home owner as the victim. The attacker in this case, could well be targeting the insurance market – which would face a deluge of claims if their washing machine suddenly flooded for example. Sian John, Security Strategist at Symantec, then focused on the IoT standards and privacy landscape. She argued that IoT is in fact rapidly becoming the ‘Internet of Everything’, where increased connectivity is being applied to every aspect of everyday life. Whilst this may delivery better service or convenient experiences, this also opens up new security vulnerabilities and issues with regards to consumer data privacy. Whilst the IoT ecosystem is clearly focused on physical devices, Sian argued that there is in fact a triad of forces at work: namely people, things and data (albeit I prefer ‘people, data and devices…‘). Often, the weakest link is the people aspect, who are often concerned with regards to personal data privacy, but don’t have the knowledge or understanding with regards to terms of condition, consent questioning or device configuration. Sian also pointed out that many consumers have a deep distrust of both technology vendors and social network operators when it comes to personal data privacy. Overall, it seemed the discussions were focused on the need for a strong and varied security ecosystem, that can focus on the entire ‘chip to cloud’ life cycle of IoT data, where the identity of both the devices and people associated with those devices is strongly managed. OpenDJ Security Advisory #201504It’s official! All of ForgeRock’s projects are moving to Git.